Torrey Pines Golf Course is located on a picturesque bluff a couple hundred feet above the Pacific Ocean, which means it is extremely exposed to the ocean breeze. 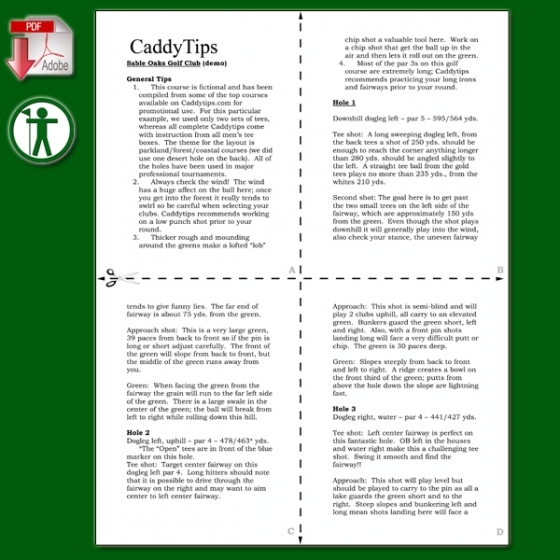 Caddytips recommends practicing your knock-down or "punch" shot prior to your round. Good swing thoughts for a knock-down shot include putting the ball slightly back in your stance at address and keeping your hands in front of the clubface at impact. Torrey Pines Golf Course is a coastal course layout and has a lot of water that is retained in the soil base. This means that the fairways are typically quite soft, especially when compared to other regions of the US. Roll after the shot on almost any coastal course will be minimal at best. Obviously, the trajectory and speed of a shot will have a lot to do with the roll, but on a typical drive, one shouldn't expect much more than 10-15 yards of roll. Hence, Torrey Pines Golf Course will usually play longer than the yardage on the scorecard. And remember the old adage, "If it’s breezy, swing easy." The harder you swing, the more backspin you impart and the higher the ball goes, making it much easier for the wind to affect your shot. When playing into the wind, Caddytips recommends teeing your ball a ½ inch lower to penetrate the wind, and conversely, teeing your ball a ½ inch higher when playing downwind. Most of the holes at Torrey Pines Golf Course South slope towards the ocean, so breaks will tend to hunt down the bluff towards the ocean. If you are struggling with the break direction of a putt, consider the influence of the gravitational pull down to the ocean. Tee shot: There’s lateral hazard all along the left side of this hole in the left rough to be cautious of. There are a series of bunkers to negotiate in the right rough that begin approx. 250 from blacks and blues, and 230 from whites. An ideal tee shot would be played left center of the fairway to allow the best angle of approach for the second shot. Second shot: This is a very strategic shot that must be well thought out. Long hitters that elect to go for the green in two need to carry the ball all the way to the putting surface as there is a steep uphill short in front of the green. If you feel like you cannot successfully reach the putting surface 7 out of 10 times, elect to lay up. When playing the lay-up shot, it is important to understand that the lay-up area is blind to the player, so you must pick the proper club and trust your swing. There is a large downhill swale that begins 200 yards away from the green and then the hole continues up at a very steep angle. The ideal lay-up position is 150-130 yards away from the green where there is a flat landing area. There is another flat plateau from 90-80 yards away but it is much smaller and a higher risk target, but will yield a good opportunity to spin your approach shot. Approach shot: From the 150-130 landing area, this shot will play a full club uphill, so add ten yards. Again, the approach must be carried all the way to the green as anything that lands short will either catch a couple of bunkers short left of the green or one of three bunkers short right of the green. There is a large extended fringe area which slope steeply uphill in the front center of the green which will send short shots rolling back down hill a good 25-30 yards. Also take note that there is a hidden bunker long behind the center of the green that will catch anything that doesn’t bite. Green: This green has a valley effect, where the right-hand portion of the green tilts slightly from right to left towards the center of the green, and the left-hand side of the green tilts from left to right towards the center of the green. Most puts will hunt towards the center of the green. The green also slopes from back to front.